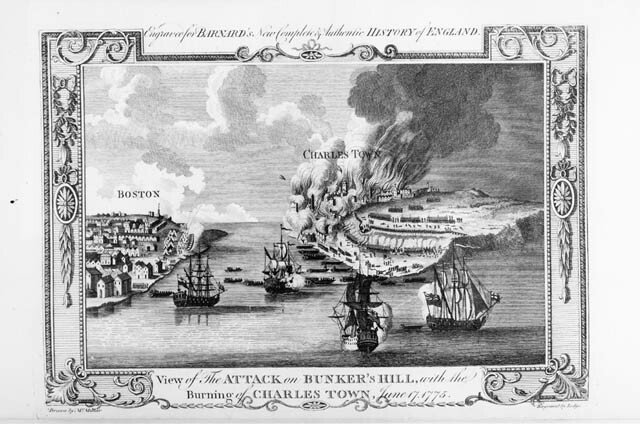 Robson Map: Depicts the Battle of Breeds Hill, where Charlestown was burned by the British. 242 years ago on June 17, 1775, Charlestown was set ablaze to drive out three companies of American militia. At the outset of the Battle of Breeds Hill, these militiamen had taken positions on the north side the town. As the ranks of redcoats marched up the slope of Breeds Hill to Warren’s Redoubt the militiamen and fired into their ranks, likely taking a hundred or more out of the battle before the main action got started. Imagine you are in the militia with these men. It is a sweltering afternoon with the sun high overhead. The British gunships on the other side of town in the Charles River and the battery at Copps Hill in Boston blast a screaming leaden hail of fiery-hot grapeshot at the mostly wooden buildings you have been using for cover and concealment. The gun-smoke blowing on the wind is, by degrees, pushed out by wood-smoke as the temperature in Charlestown rises. My ancestor, Isaac Frye, was one of these militiamen, serving as a 2nd lieutenant and quartermaster for Colonel James Reed’s 3rd New Hampshire Regiment. During the battle Isaac Frye was assigned to Captain Josiah Crosby’s company along with a number of the men from his hometown of Wilton, New Hampshire. In The War has Begun, Chapter 5 describes what I imagined it would have been like to be there, marching into Charlestown, taking up positions, and firing on redcoats who were marching by–easy targets, far too easy. It must have weighed on those men’s souls to shoot an enemy who was not facing them. The inferno driving them from Charlestown, to some, must have seemed as if gates of hell had been thrown open. If the illustrations and engravings depicting Charlestown’s fate are true, the flames from the resulting conflagration towered a hundred feet, and the smoke could be seen for dozens of miles. It took three years to definitively locate Isaac Frye during the battle. The idea was that I could help my oldest son with his 5th grade history project. We decided to figure out where Isaac Frye was during the Battle of Breeds Hill. In the two weeks he had to finish his project, we learned Isaac Frye was in Reed’s regiment, and therefore he was either at the rail fence or there was a chance of him being with Crosby’s company in Charlestown. About two years later I discovered New Hampshire’s Rolls of the Soldiers in the Revolutionary War, where I learned the composition of Crosby’s company, which included men from Wilton. The final proof came a year later when I learned there were additional volumes in New Hampshire’s state papers pertaining to the Revolutionary War. There, I found a record for the men of Crosby’s company who had lost clothing and other articles in Charlestown, and the list included Isaac Frye, who lost a coat and hat. Bouton, Nathaniel D.D. 1878. “Provincial Papers. Documents and Records Relating to the Province of New-Hampshire, From 1764 to 1776; Including the whole Administration of Gov. John Wentworth; the Events immediately preceding the Revolutionary War; the Losses at the Battle of Bunker Hill, and the Record of all Proceedings till the end of our Provincial History.” Volume VII. Orren C. Moore, State Printer. Nashua, NH. p 596. Frothingham, Richard, 1873, “History of the Siege of Boston, and of the Battles of Lexington, Concord, and Bunker Hill. Also, an Account of the Bunker Hill Monument. With Illustrative Documents.” Fourth Edition, Little, Brown, and Company, Boston, MA. p136: Lists Crosby’s company as being in Charlestown. Robson, T. 1778 “Plan of the town with the attack on Bunkers-Hill in the peninsula of Charlestown, the 17th. of June 1775. Newcastle upon Tyne [Eng.]. I use the term “elusive” because I had questions about James Reed’s service in Quebec (May and June of 1776) that I was unable to answer as I wrote about him in The War has Begun. The biographical sketches I found only agreed agreed on one fact: that he was rendered blind due to a “malignant” illness he acquired at Crown Point in early July of 1776, during the Continental Army’s retreat from Quebec. One account, provided by Amos Blake in 1888, indicates Reed negotiated with Native Americans in the absence of Benedict Arnold, which would presumably have been in Quebec as that was the only time Reed and Arnold were in close proximity. I could find no evidence to support this claim. Blake mentions a letter to Congress, which may no longer exist. I searched through the Library of Congress’s holdings and the New Hampshire Provincial Congress’s records and found nothing from Reed. Add to this, the fact that Arnold was in command of Montreal, where I am now certain Reed did not go (though his regiment did). However, Arnold did negotiate with Native Americans prior to Reed’s arrival in Quebec. With regard to Amos Blake, he was a resident of Fitzwilliam, NH, the town Reed marched from in response to the alarm of April 19, 1775. Blake was a state senator, and apparently had an interest in history and Fitzwilliam’s most famous Revolutionary War soldier, James Reed. For context, I should include that James Reed’s character is consistently referred to in the highest regard. Thus, I am merely at a loss for details of his service from late May to July of 1776, when his 3rd New Hampshire Regiment was assigned to the Northern Department, which meant being sent under Brigadier General John Sullivan to support the army already in Quebec. June 3, 1776: Journal of Dr. Lewis Beebe notes that Sullivan’s Brigade, which includes Reed’s Regiment marched for Fort St. Johns to Fort Chambly. June 5, Dr. Beebe’s journal entry, tells of Colonel Reed having small pox very lightly. Noting Beebe was at St. Johns, and he described Reed as being on the other side of the river, establishing he was not at Chambly with his regiment. Note that Reed’s second in command, LTC Israel Gilman, had gone ahead of the regiment and was already at Chambly on May 30th to participate in a council of war. June 12, Alexander’s Scammell’s report on the troops in Canada (in Washington’s papers) shows about two thirds of Reed’s regiment is at Montreal. Note that Scammell prepared the report while in Montreal, and therefore had first-hand knowledge. June 13, Reed’s Regiment is noted as being at Montreal by the account in the 2nd New Jersey regiment’s orderly book. June 13, Benedict Arnold writes from Chambly, to General Sullivan. Arnold indicates he was in St. Johns on the 12th, and notes the place was in “the greatest confusion”. No mention of negotiations with native Americans. Last, if you know of the source Blake used, or have additional information about General James Reed’s time in Quebec, please leave a comment telling me about it. Beebe, Lewis, 1935 “Journal of a Physician on the Expedition Against Canada in 1776” The Pennsylvania Magazine Vol LIX, Number Four. Blake, Amos J. 1888. “GEN. JAMES REED. Sketch of his Life and Character”, Proceedings of the New Hampshire Historical Society. Vol. 1 Part 4 1884-1888. pp. 109-115. P113: On one occasion, in the absence of Arnold, he received and held a talk with the chiefs of some Indian tribes. It was managed with address, and successfully concluded by Colonel Reed ; and the pledges of their friendly disposition were transmitted by him to the president of congress. No record of this is indicated in either the Continental Congress or the New Hampshire Congress. Fitzpatrick, John C. “The Writings of George Washington from the Original Manuscript Sources, 1745-1799” in “The George Washington Papers at the Library of Congress, 1741-1799” accessed throughout 2015 and 2016. Scammell’s report and Sullivan’s & Arnold’s correspondence are in this collection. Garfield, James F.D. 1899 (read) 1908 (published) “General James Reed” Proceedings of the Fitchburg Historical Society and Papers Relating to the History of the Town read by some members. Vol IV pp. 113-124.